President Paul Kagame has said Africa’s failure to take off should be blamed on the continent’s fondness for foreign aid in exchange for its natural resources. Kagame who was closing the five-day leadership retreat today in the Eastern Province said African resources that are siphoned by the West are 100 times more than the relief they bring to Africa in form of food and development aid. “They give you food and development aid while they take away 100 times more in resources that belong to you,” Kagame said. “They threaten you with standards like Press freedoms in exchange for your silence and gratitude for their left over,” Kagame stressed. 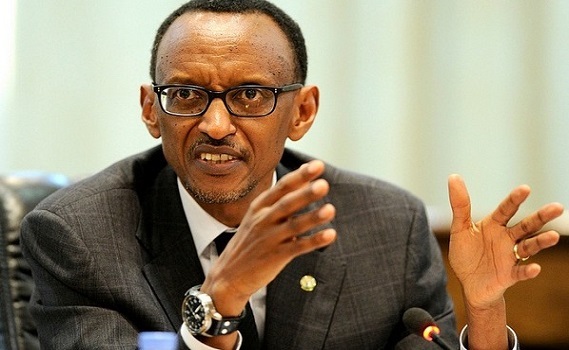 Kagame also expressed frustration that the western world maintains doubled standards by accusing African leaders of stifling Press Freedoms to divert attention from the plunder of the continent’s resources. Some countries, Kagame said, have gone to the extent of threatening African states to cover up their crimes on the continent. “But how can you blame anyone else for our place in the world when we are the ones who accept it?” he wondered. “We should not accept to be relegated to a people who do not deserve to pursue high ambitions and better life for us,” he said. “When we say we want to produce goods and trade; they tell you that your place is to receive development funding,” Kagame said. Kagame said Rwandans should not accept such behavior and instead work tirelessly to liberate themselves from poor living standards and achieve the desired development. “We also have to be truthful that when you spend 14 years repeating the same mistakes, we need to things differently,” Kagame said. Kagame said Rwandans through innovations can transform their country three times as much from the current growth. “We should be innovative, look at the resources we have and strive to use them to achieve three times more than they are now,” Kagame said. “Our past has shown us that the lack of resources does not stop us from achieving”. He told the Rwandan leaders that doing what they have to do citing proper use of public funds, was not a miracle but an obligation and responsibility to the Rwandan citizens.